Bali Senia Hotel welcomes you to Bali. Our hotel is located in the fishing village of Sanur. A pleasant 5 minute walk to the beautiful white sandy beaches of Sanur, and only 20 minutes drive from the airport. With 18 rooms, Bali Senia Hotel provides a friendly family atmosphere. 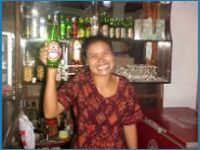 Our Balinese staff are all family and are more than happy to share their rich culture and language with you. We pride ourselves on security and honesty and wish to make your stay an enjoyable one. The hotel has a bar and restaurant offering a mix of European and Indonesian cuisine. Meal prices range from $US1-$US5. Hotel facilities include Safety Deposit Boxes, Tourist Information, Bar, Restaurant, Massage Service, Internet, Fax and Telephone Service and 24 hour security. 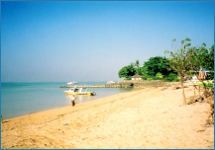 Nearby Sanur Beach is famous for its beautiful sunrise and water sports such as surfing, jet skiing, fishing, sailing, snorkling, scuba diving, wind surfing, parasailing and kiting. We are more than happy to organise any of the above mentioned sports for you. Besides the abundance of water sports, Sanur is also famous for the quality and range of restaurants. A short stroll along the beach or main street will provide you with an unlimited range of extremely well priced and high quality dining options. Sanur's best quality is the peacefull relaxed lifestyle lead by the local people. Where the more well known Kuta Beach is only 15 minutes away by taxi, Sanur is the hidden paradise of Bali. In Sanur you will not find the hassle of hagglers on the streets, traffic jams, pollution and commercialisation that is synonymous with Kuta. 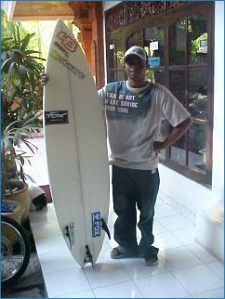 People come to Sanur to relax and enjoy the local culture, cuisine and water sports. 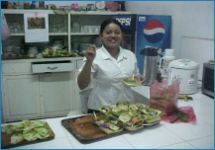 The hotel has an excellent reputation with the local expat community for serving wholesome home cooked meals. 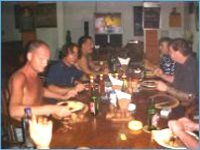 The restaurant is a great place to meet up with people and share their knowledge of Sanur and Bali. Restaurant is open from 7. 30am-10. 30pm. Drinks available 24hrs plus 24hr security. Internet, phone and fax service available. Apartment with double, twin or triple accommodation available. Cooking facilities available in apartment. The hotel is situated in a quiet area of Sanur but only minutes to the beach, shopping centre, restaurants and night clubs. Specialising in Western and Indonesian cuisine. The hotel is located on Jalan Danu Poso 23, Sanur. 50 meters past the Circle K convenience store. Local buses run past the hotel. Taxi's available at the hotel. Private transportation can be arranged by the hotel.